Since then ARTC has grown and thrived, although getting actual radio airtime has grown substantially more difficult as the airwaves have been consolidated by major corporations who largely syndicate programming rather than cultivate it locally. But no matter, ARTC now distributes through several other non-radio means including live performance (6-8 shows per year, largely at science fiction conventions where we have an avid following), podcasting (currently with the Centauri Express Audio Magazine, but launching more later this year and next), and studio recordings distributed for sale through our website and other online vendors including Audible.com. ARTC’s growth has been steady, but slow. We have tried many approaches to getting our special brand of audio drama to the world, with sometimes mixed results. Growing out of a hobby organization (our founder often expresses his surprise and admiration that we’ve made it this long and this far) and being all-volunteer has influenced our decision-making, and not always in a good way. Another major challenge has been that our art form is frequently regarded as nostalgia. Until very recently it wasn’t common for audio drama to be considered something that was still in active production in this country and trying to communicate what we were doing to potential listeners was occasionally difficult. Today, however, there are many professional and independent audio drama producers and the art is experiencing a resurgence. ARTC produces a high-quality brand of audio drama. We insist on good sound (whether in our live venues or in the studio) and a deep soundscape that brings the listener into the environment with the characters. We also have a definite style to the scripts we produce. It is extremely common for even our experienced writers to bring scripts to rehearsals where feedback is encouraged from the entire company. This workshopping process can result in as many as 4 or 5 revisions before a script is ready to be considered for production. 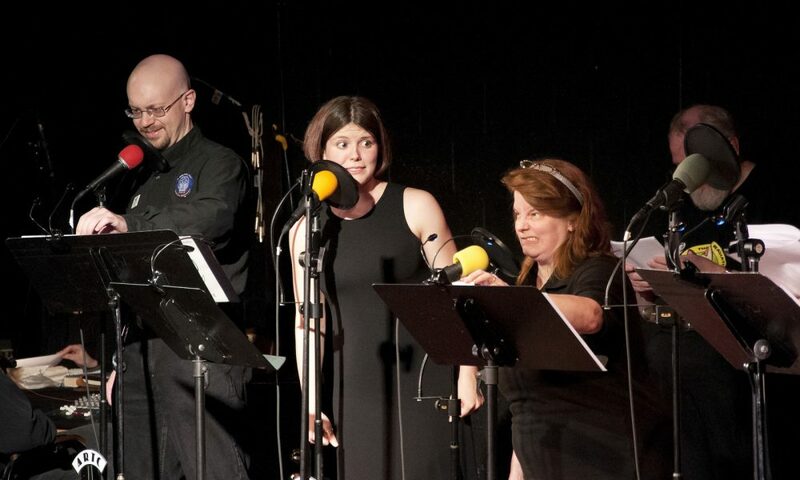 Further, we are one of the only audio drama producers in the world to perform live as part of our regular operations. Many other companies will do occasional special events of their show, but ARTC has been performing 6-8 shows per year for most of our existence in a wide variety of venues. We have used traditional stage theatres, of course, but our most common venue is the acoustically-challenging hotel ballroom. We have also performed at coffeeshops, bookstores, outdoor venues (our least-favorite), and on one memorable occasion a hair salon. We also span a wide variety of genres. Horror, Science Fiction, and Fantasy are our staples (as they are well-suited to audio drama), but we also have Romance, Comedy, Adventure, and some that defy most traditional categorization. It was not until fairly late in my life that I realized that I had been interested in audio the entire time. I came to ARTC in 1996, but looking back I noticed that I had been listening to early examples of what today we would call audiobooks since my childhood. I tend to be a Jack-of-all-Trades with broad interests in various subjects. In college, I started out as a Physics major, but eventually made my way over to Marketing, although I still maintain an interest in physics, astronomy, and the other sciences in general. Couple that with an interest in performing (lots of early talent shows, drama clubs, etc) and you have a recipe for someone who enjoys things that are a little on the fantastical side.